Made from quality ceramic, this sake flask and cups set come with a charming sake flask and two matching sake cups and is a poetic way to enjoy your favorite sake with a loved one. 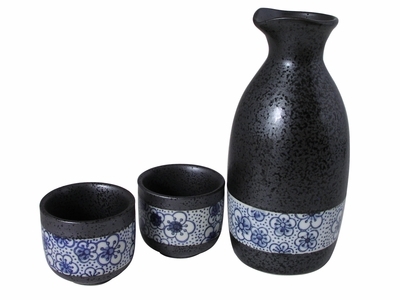 With a delicate blue and white print design of cherry blossoms set against a stylish metallic speckled grey background, this sake flask and cups set for two makes an ideal gift for couples and anyone who enjoys sake. A modern metallic grey background featuring black speckles gives a contemporary aesthetics that is beautifully complemented by a simple and classic design of cherry blossoms in blue and white. Designed with curved lip at the rim to ease the serving of sake, the sake flask in this lovely sake serving set is great for serving sake both warmed and chilled. Crafted in China, this sake flask and cups set for two comes packaged in a paper box. Hand wash is recommended for this item.